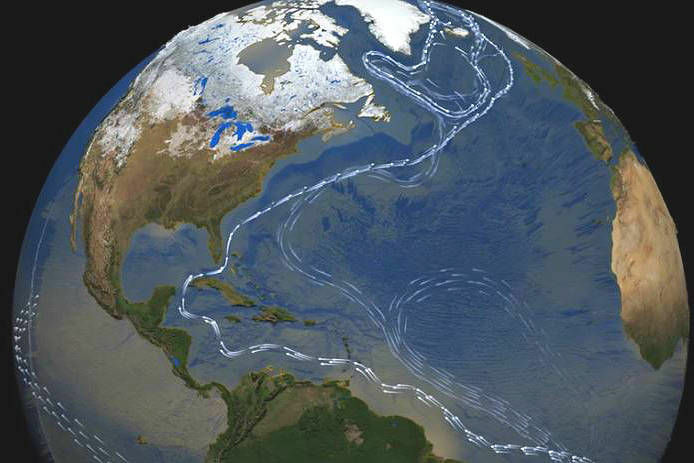 The Gulf Stream is a complex series of currents that wrap around the earth like a conveyor belt. The Gulf Stream flows from Florida toward Europe, its water often 15 degrees warmer inside the current. NASA's Goddard Space Flight Center. Titan, a supercomputer at Oak Ridge National Laboratory, can do quadrillions of math problems per second. Photo provided by Oak Ridge National Laboratory, U.S. Dept. of Energy. Computer-generated simulations show oil spills off the southeast coast could travel fast in the Gulf Stream or hit beaches depending on spill sites. Oil spills in the Gulf Stream off South Carolina could form fast-moving slicks for hundreds of miles, making cleanup nearly impossible, devastating one of the Atlantic's most important fisheries and wreaking havoc with the state's billion-dollar tourist industry, a Post and Courier analysis shows. While spills in the Gulf Stream would travel far, spills closer to shore could ooze their way toward land, fouling beaches and marshlands anywhere from the Lowcountry to North Carolina's Outer Banks. In what's thought to be a first for a news organization, The Post and Courier generated more than 1,000 simulations of potential spills off the East Coast. The newspaper used a program developed by the National Oceanic and Atmospheric Administration that takes into account amounts of oil spilled, weather patterns and ocean currents, including the Gulf Stream. Simulations ranged from a spill of 1,000 barrels to a worst-case scenario: the 4.9 million-barrel BP/Deepwater Horizon disaster in 2010. In many medium-to-large spill scenarios, the Gulf Stream is like a high-velocity pump. Spills in the powerful current would spread quickly. Within two weeks, slicks off Georgia could hit the Outer Banks and then move into deeper waters off Virginia and pivot toward Europe. The Gulf Stream also serves as a lid — one that traps oil between the current and our coast. If spills happened within 50 miles of South Carolina — before the Gulf Stream — oil plumes could coat beaches along the tourist-driven Grand Strand. Other simulations show oil hitting the North Carolina coast around Wilmington and the Outer Banks. Shifting winds and currents add layers of complexity to oil-spill predictions — and potential cleanup operations. In some scenarios, winds push oil ashore. In others, oil ends up in eddies that spiral miles offshore. The newspaper's simulations come amid a heated debate about the potential risks and rewards of oil exploration along the East Coast. This composite of simulations shows which beaches are most vulnerable and how some slicks quickly get swept up in the Gulf Stream. The federal government had blocked exploratory work for decades. But earlier this year, the Trump administration moved to open offshore waters from Georgia to Maine. The shift generated furor in many coastal communities and has become a major campaign issue in South Carolina’s 1st Congressional District race. The Bureau of Ocean Energy Management regulates offshore exploration, and the agency has done thick reports on potential threats to the environment. But these documents don't include simulations of how a spill in or near the Gulf Stream would play out. "There hasn’t been oil and gas activity in the Atlantic in more than 30 years, so there’s been no need for any oil spill simulator studies," said John Filostrat, BOEM spokesman. Yet the absence of such analyses is remarkable given the stakes and Gulf Stream's immense flow. Oil spills were simulated using GNOME software developed by NOAA. There are three main forces at work in each simulation: currents, wind, and diffusion. Currents were modeled using the Navy Coastal Ocean Model (NCOM) which is produced by the Naval Oceanographic Office. Winds were modeled using the Global Forecast System (GFS) which is produced by the National Weather Service. Diffusion is a random process that occurs as oil naturally spreads out over time. It was modeled using a "random walk" process with a diffusion coefficient of 100,000 cm^2/sec. All simulations occur from July 28, 2018 to August 11, 2018 and use model data generated on August 8, 2018. These simulations show what could happen at certain locations at a certain time. They are about as accurate as a weather forecast. Running at 2 to 5 mph, the current can transport drifting materials for thousands of miles. It's also one of the world's most important migratory highways for fish, whales and other marine life. And it flows past South Carolina's coast, a key driver of the state's $19 billion tourism industry. To fill this gap, The Post and Courier obtained a publicly available program called GNOME, short for General NOAA Operational Modeling Environment. Federal data on weather and currents between July 28 and Aug. 11 were used in the paper's calculations. Officials with NOAA did not participate in the analysis. The newspaper analyzed more than 1,000 hypothetical spill scenarios at different locations and with varying amounts of spilled oil. Taken together, the simulations show the Gulf Stream's tremendous effect on spills, large and small. Spills in the heart of the current would move quickly. Within 24 hours, a spill in the Gulf Stream off Charleston would travel more than 90 miles — a pace that would pose an immense challenge for any cleanup crew. Weather and other factors also play a huge role. Depending on their directions, wind can blow oil in and out of the Gulf Stream, simulations show. Sizes of spills also matter. Some small-spill scenarios show slicks contained to a small area. In others, even small amounts would form long, dark spirals. In general, though, small spills, such as those involving 1,000 barrels, dissipate more quickly in the Gulf Stream while moderate and large spills would affect hundreds of miles of ocean. The newspaper’s results are similar to simulations NOAA created to analyze the dangers of old shipwrecks, including some in the Gulf Stream. In those studies, NOAA analyzed potential slicks from ships that sank with large amounts of oil aboard but have yet to leak — or even be found. For instance, one analysis focused on the Esso Gettysburg, a tanker sunk by a German U-boat in 1943 in the Gulf Stream about 100 miles east of St. Simons, Ga. It went down with 131,000 barrels of oil and has yet to be located. The NOAA analysis estimated that if 10 percent, or 13,200 barrels, from the shipwreck leaked into the Gulf Stream, an area the size of California — about 152,000 square miles — could potentially be affected. Oil industry experts and federal regulators say large spills are rare. Since 1969, 44 spills larger than 10,000 barrels, or 420,000 gallons, have taken place in U.S. waters, according to NOAA data. Experts also note that large spills have decreased over the past four decades. Smaller spills are more frequent, with about 2,600 incidents reported annually in recent years, Coast Guard data shows. Spills from tankers are more likely than those from drilling rigs. Still, the Gulf Stream's complex and swift currents would make cleanup difficult, said Matthew Upton, president of Roffer’s Ocean Fishing Forecaster Service. The company studies ocean currents and weather patterns daily for fishing, researchers and oil industry clients. Upton noted that much of the 2010 Deepwater Horizon spill stayed out of the Gulf of Mexico’s Loop Current, which eventually connects with the Gulf Stream, so that spill was somewhat contained. “But if something happened within Gulf Stream, it would spread much more rapidly and be impossible to control." An oil spill anywhere near the Gulf Stream would be a monumental mess, potentially affecting hundreds of miles along the Atlantic Coast and wreaking havoc on one of the world’s most abundant marine ecosystems. J. Emory Parker is the interactive editor at The Post and Courier. Before joining the paper in 2013, he was a molecular biologist. His focus is on blending journalism, science, and technology to tell stories in innovative ways.